The Museum runs an After Hours event called Crime Scene Live that in February featured micropalaeontology curator Steve Stukins. Micropalaeontological evidence is increasingly being used to solve major crimes. Read on to find out about Steve’s involvement in Crime Scene Live, how our collections could help forensic studies and how our co-worker Haydon Bailey gathered some of the evidence that was key to convicting Soham murderer Ian Huntley. 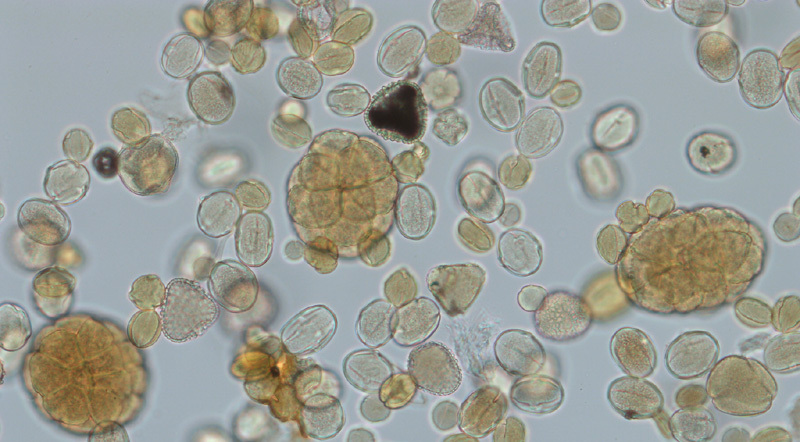 The following image is of modern pollen, so could be described as botanical rather than micropalaeontological evidence. A variety of modern pollen types similar to the ones investigated at the Crime Scene Live event. 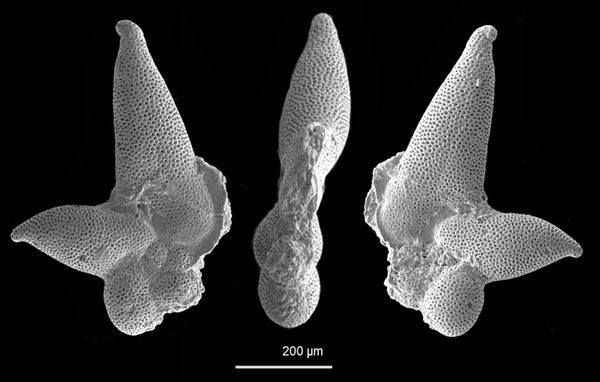 As I mentioned in my post What is micropalaeontology?, distinguishing when something is old enough to become a fossil is difficult, particularly when some modern species are present in the fossil record. The Museum's microfossil collections contain modern species, particularly our recently acquired modern pollen and spores collection, and this collection has enormous potential as a reference for forensic investigations. What can microfossil evidence tell us? Because organisms that produce microfossils are present in a wide range of modern and ancient environments and can be recovered from very small samples, they can provide a lot of useful information. Mud or sand recovered from boots or clothing can show where the wearer has been and even the pollen content of cocaine can provide evidence of its origin or where it was mixed. 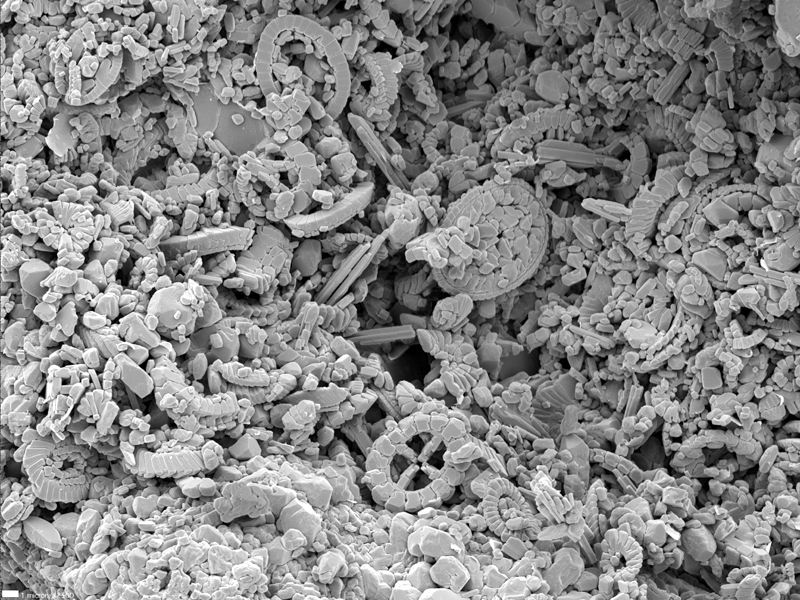 A scanning electron microscope image of British chalk showing nanofossils. These details can relate a suspect to a crime scene, relate items to a suspect/victim or crime scene and prove/disprove alibis. Evidence can also show cause of death, for example, diatoms or freshwater algae present in bone marrow can indicate drowning. 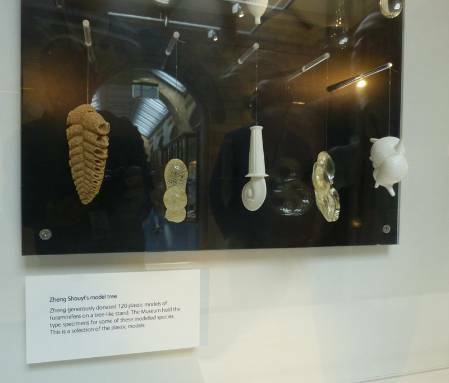 Haydon Bailey, who is working temporarily at the Museum on a project studying our former BP Microfossil Collection, provided some key evidence that convicted Ian Huntley of the Soham murders. Haydon identified chalk nanofossils on and inside Huntley’s car that were common to the track leading up to the site 30 miles from Soham where the bodies had been dumped. For details about all the scientific evidence used, this article on the Science of the Soham murders is an interesting read. Members of the public participating in Crime Scene Live activities. 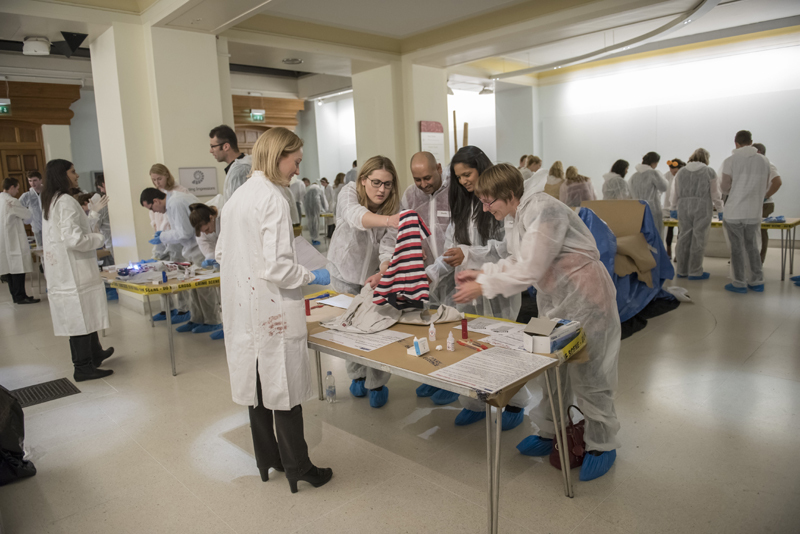 "This special public event gives the audience a chance to become a crime scene investigator for the evening using techniques employed by scientists here at the Museum. People are often surprised that the Museum is involved in forensic work, especially using entomology (insects), botany (plants) and anthropology (analysis of human remains). Crime Scene Live uses all of these disciplines and forms them into an engaging scenario for the visitors to get involved in. Palynology, in most cases pollen, is used quite often in forensics. As pollen is extremely small, abundant and diverse in many environments it can be used to help determine the location of a crime and whether a victim/perpetrator has been in a particular place by understanding the specific pollen signature of the plants in an area. Our jobs as forensic detectives in the Crime Scene Live Event were to determine where a smuggler had been killed, for how long he had been dead and the legitimacy of the protected animals he was thought to be smuggling. I’ll be giving away no more secrets about the evening, other to say that it was a great pleasure to be involved in a thoroughly enjoyable event and the feedback from the visitors was superb." So if you fancy a bit of murder/mystery then why not come and help micropalaeontology curator Steve Stukins solve the Case of the Murdered Smuggler on 1 May or in October. Details of other Crime Scene Live events scheduled for this year can be found here. Last month we welcomed our new student Marina Rillo, who is studying for a PhD on the evolution of planktonic foraminifera. The collection she is studying is very relevant to climate and oceanic studies and was compiled by the inspiring Henry Buckley, a curator in the former Mineralogy Department. 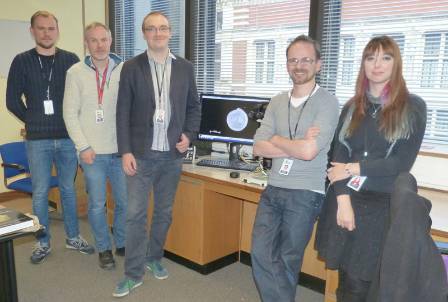 This post outlines how the collection was made, Marina's project and why the study of planktonic foraminifera and our collections are very relevant. 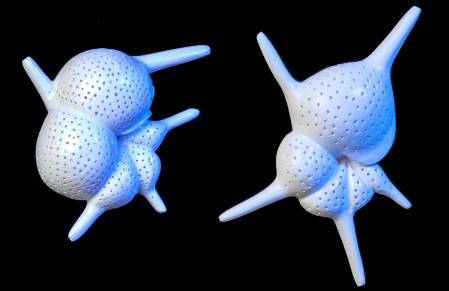 Foraminifera are a class of protists (single celled organisms) that are characterised by granular ectoplasm. They are almost exclusively marine but also occur in freshwater and brackish enviroments. The species Globorotalia (Clavatorella) oveyi (left) was originally described by Henry Buckley in 1973 and named after one of my curatorial predecessors, Cameron D. Ovey. The name is derived from the term foramen or opening as each shell or test has one or many openings. 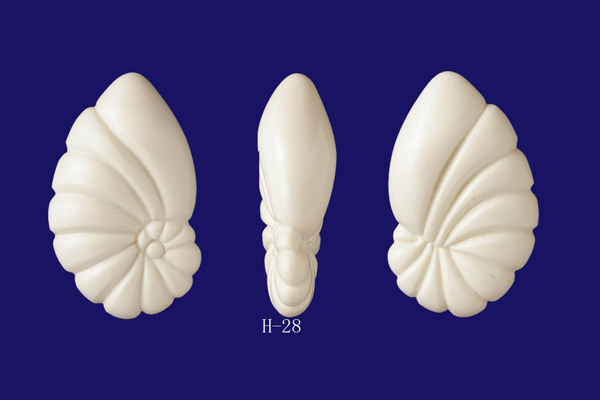 All planktonic foraminiferal tests are composed of calcium carbonate, but benthic varieties can have shells made of agglutinated sediment and others are naked, ie composed completely of organic material. Henry Buckley was a curator in the Museum's Mineralogy Department for much of his life and died in 2002 shortly after his retirement. His curatorial work focused on the Ocean Bottom Deposits (OBD) Collection, and he developed a research interest in the taxonomy of planktonic foraminifera. Part of the 1999 Mineralogy Department photo displayed in the Mineralogy corridor beneath Waterhouse Way, known to staff as the 'Miner-alley'. Henry Buckley is the smiling character wearing a tie in the middle on the back row. 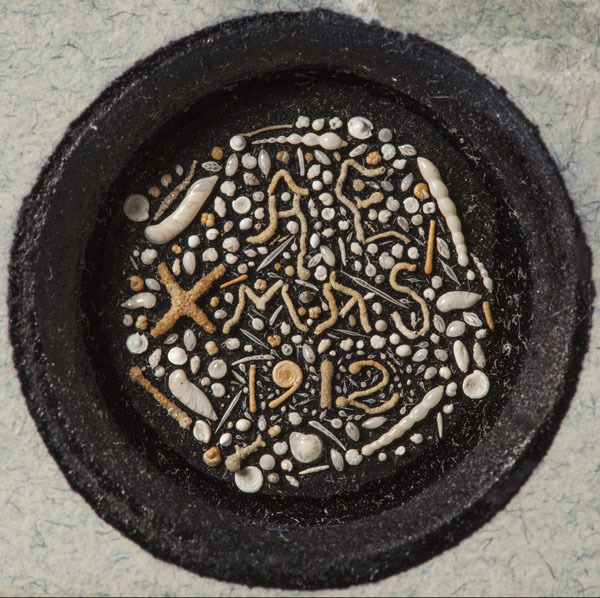 The OBD Collection consists of samples from some 40,000 locations worldwide and is the most comprehensive British collection of seabed samples and cores, with all the world's oceans represented. The Sir John Murray Collection, which includes the HMS Challenger 1872-76 sea-bed samples, was given to the Museum by the Murray family in 1921 following his death in 1914 and forms the most significant part of the collection. Slide from the Henry (Alexander) Buckley collection, where he formed his initials from specimens of Globigerinoides ruber (Image by Giancarlo Manna). 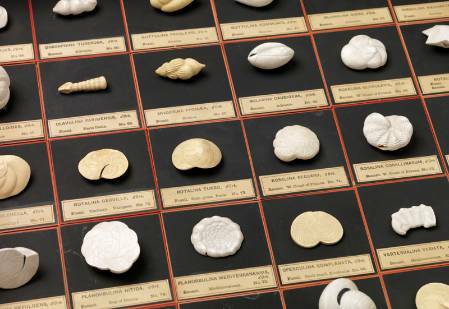 Despite the fact that he was actively discouraged by his managers in the Museum from carrying out work as a micropalaeontologist, Buckley amassed an amazing collection of 1,500 slides of individual species of planktonic foraminifera that he extracted from over 260 samples from the OBD Collection. 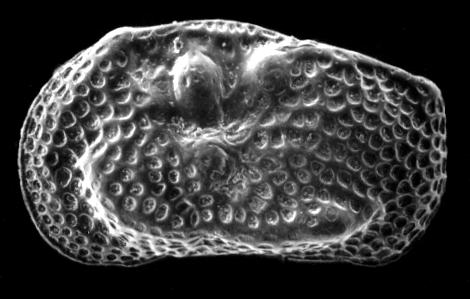 He published relatively little on the planktonic foraminifera but was a pioneer of scanning electron microscopy, leaving a collection of over 10,000 scanning electron micrographs of planktonic foraminifera with the collection. He was also one of the first to publish on the relationship of seawater to the composition of foraminiferal tests. 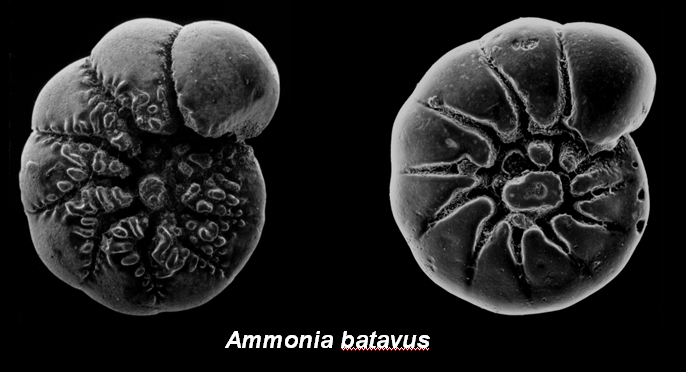 Because planktonic foraminifera secrete calcium carbonate directly from the sea water in which they live, their isotopic composition can give an indication of the isotopic composition of the oceans at the time. The ratio of oxygen isotopes 16O to 18O in sea water is a very good indication of past climate. A higher abundance of 18O in calcite is indicative of colder water temperatures, since the lighter isotopes are preferentially stored in ice. Recent high profile publications have highlighted the use of planktonic foraminifera in studies providing evidence that records of carbon dioxide in the atmosphere millions of years ago support current predictions on climate change. From observations of the modern day distribution of planktonic foraminifera, we know that some species prefer to live in warmer waters while others prefer more polar settings. The situation is of course far more complicated than these simple explanations suggest and a variety of different factors can affect their distribition and evolution through geological time. The Buckley and OBD collections contain vast numbers of planktonic foraminifera from ocean basins around the world. They are therefore a very valuable tool for studying the effects of global change on recent foraminifera, as well as the factors that drive evolution in general. 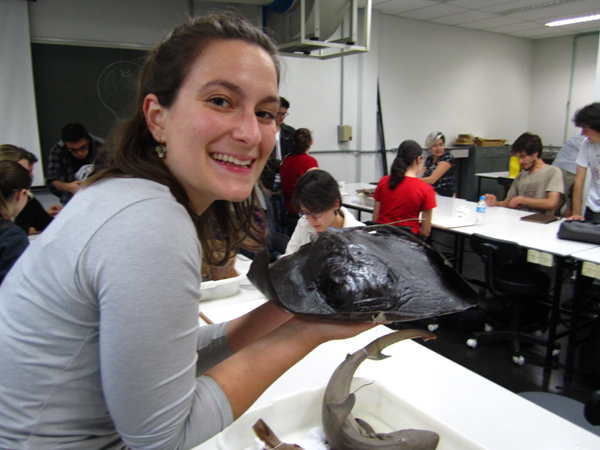 Marina Rillo, who is studying for a PhD on the evolution of planktonic foraminifera. "The Buckley collection will give us many insights on evolutionary processes, because it reveals not only foraminiferal diversity by number of species, but also the great morphological variety within each species"
She will be based at the Museum for the first six months of her project and will be supervised by myself and Prof Andy Purvis in Life Sciences. The remainder of her PhD will be spent at the University of Southampton with her main supervisor Dr Tom Ezard. In the last month we have heard that David King is also joining us to study for a PhD via the London Doctoral Training Programme. David will also be studying the evolution of planktonic foraminifera and will jointly supervised by myself, Prof. Bridget Wade at University College London and Mark Leckie (UMass, USA). Look out for future posts highlighting David's project and for updates on Marina's project. I'm sure this news would have made Henry Buckley smile! Answering questions about the collections and subject areas of expertise is a 'bread and butter' job for a curator that often goes unnoticed at end-of-year reporting. 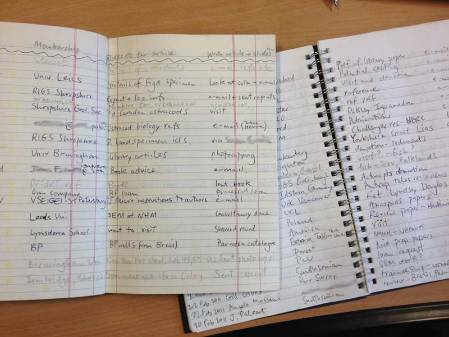 Since January 1996 I have kept notebooks recording details of all the external enquiries I have answered. In this post I look back over my enquiries books to choose some that gave me most satisfaction, made me sad, nostalgic, resulted in important discoveries, were smelly or just weird! My enquiry books with details of every enquiry I have answered since 1996. 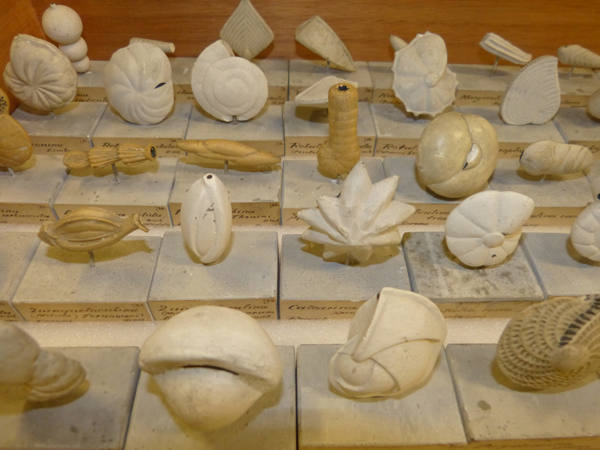 Can I visit the collections/micropalaeontology library? 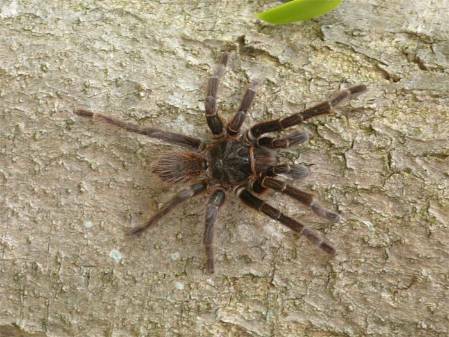 Do you have a particular species in the collection? Do you have material collected by so-and-so? Do you have Cretaceous/Jurassic (or any other age) material from (substitute name of country/city/town/site etc)? Can you provide an image of one of your specimens? Please can you provide a copy of one of your papers or an article present in the Museum Library? Please can you peer review a manuscript for a journal/book/magazine? Who do I contact to gain access to the dinosaur collection? Can you provide information about techniques to collect, process and illustrate microfossils? Please provide a letter of support for our grant proposal to fund a project that will use your collections. Can you provide a reference for a job application by one of your former volunteers or staff members? Can you carry out some commercial work to date a rock sample? Can you present an evening lecture at our local geological society? Please provide information about UK stratigraphy or microfossil collecting sites. Please provide advice on curation policies and procedures. Please comment on these museum display/book figure captions. Can you provide career advice? Can you value or provide advice on how to value museum objects? Can you provide information for a press article? And finally... Tell me all you know about micropalaeontology (yes, I was once asked this). Most questions come from academics or students, but we also deal with commercial enquirers, local amateur groups, artists, general members of the public, media and personal contacts. My post on who visits our collections and why? looks at this in more detail. Have the types of enquiries changed over 20 years? When I first arrived at the Museum many enquiries came from contacts I had made prior to coming to the Museum and were often requests for literature or details of my PhD work. At the time I was in charge of the Former BP Collection. Nobody knew we had it and BP had placed some restrictions on access so very few of my enquiries related to collections access. As my career progressed I became responsible for larger parts of the collection until in 2011 I became responsible for the entire microfossil collection and now receive at least one enquiry per working day of the year and five times as many enquiries per year as I did at the start of my career. What enquiry gave me the most satisfaction to answer? Looking back it was particularly satisfying to see enquiries that led to visits that started major research projects or resulted in key publications. In a previous post I mentioned a visit by Paul Pearson of Cardiff University that initiated a long term research project on exceptionally preserved material from Tanzania. Which enquiries made me most nostalgic? These would have to be ones where I made first contact with people who subsequently became colleagues or long term collaborators. For example I was amazed to read that I first met Dermeval do Carmo when he visited in 1997. 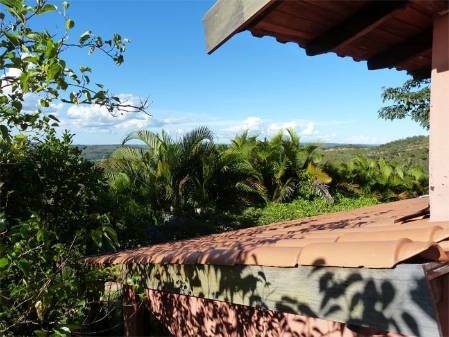 He recently invited me to Brazil to give a course on managing collections. Another enquiry from the late 1990s was from another Brazilian - Martha Richter who wrote a paper with me, subsequently applied for a job here at the Museum and later became my boss! 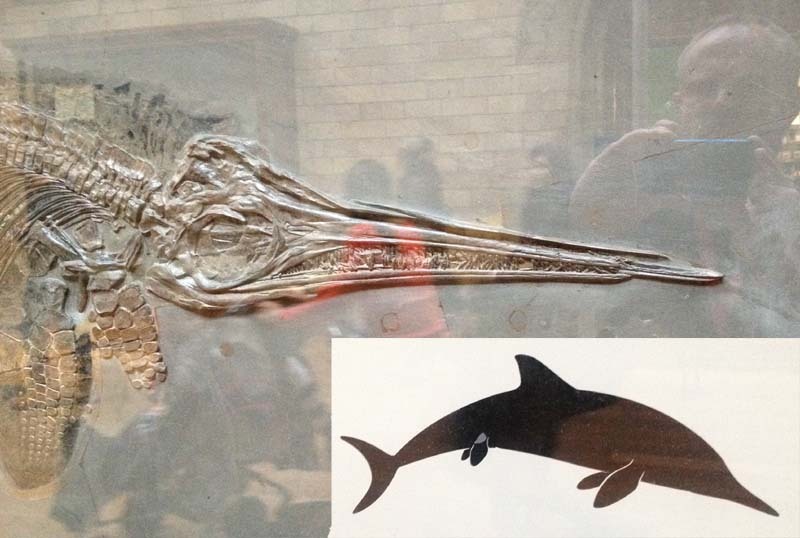 Part of one of the ichthyosaurs on display in Waterhouse Way at the Museum and the outline of an ichthyosaur used elsewhere in the display. What was my smelliest enquiry? When I first came to the museum in 1993 there used to be a desk in the department foyer where enquiries officer Vie Wasey sat and members of the public would bring specimens for identification. When she was away we took it in turns to stand in for her. One time a member of the public brought a shoe box in which he said there a was an ichthyosaur skull he'd found on the beach at Lyme Regis. As he unwrapped the specimen a terrible rotting stench filled the room and I sent him quickly off to the Zoology Department as it turned out to be a dolphin skull! What enquiry made me saddest? I was once standing in for my boss and as a result I received a detailed enquiry relating to a specimen in a collection managed by one of my colleagues. Shortly afterwards the enquirer sent me an irate e-mail asking why I could not immediately locate and give advice on a specimen in another part of the Museum collection that they wanted to cast/borrow/prepare. 'Surely anyone should be able to do this?' was their response. That particular correspondence prompted me to write a blog post entitled Do we need specialist curators? What was my strangest enquiry? In the very early days of email correspondence I was contacted by someone who was convinced that I was witholding information about microfossils present in the stones at Stonehenge. It took some time before they stopped asking me for details. They even asked if they could visit to see the collections as they did not believe me. Did any enquiries lead to important discoveries? In 2006 I was sent a sample of limestone to analyse by an oil company in Oman. They wanted me to recover conodonts to date a rock formation. The rock contained no conodonts but it did contain tiny fragments of some of the oldest fossil fish ever discovered. Since then I have visited Oman twice to collect more and I have been sent much more rock from Oman to analyse that has yielded both conodonts and fish and has led to several publications. 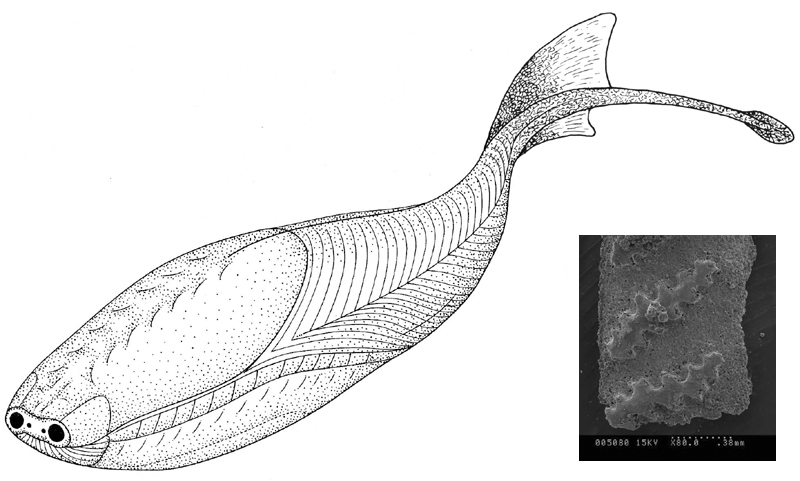 Reconstruction of the early fish Sacabambaspis (with permission from Ivan Sansom, University of Birmingham) and a scanning electron microscope image of a Sacabambaspis scale from the Ordovician of Oman. My job is changing over the next few months to 'Collections Manager of Micropalaeontology, Petrology and Ores'. This means that curators under my management will have responsiblity for answering many of the types of collections enquiries I have listed above. I have decided to stop keeping my enquiries book but I shall continue to blog! I was feeling very nostalgic this week as I helped to process a loan of 450 slides from a collection I curated back in 1994. The Former British Petroleum Microfossil Collection was donated to us in 1991 when BP closed their micropalaeontology operations at Sunbury. Part of the Google Earth Map compiled by Steve Stukins to show the global distribution of well material in the collection. A major new project funded by BP is re-visiting this collection, imaging and re-identifying the material and looking at associated documentation to deliver data in new and innovative ways. The collection consists of over 300,000 items of slides and microfossil residues collected from over 4,000 wells worldwide that were drilled by BP from the late 1960s until the early 1990s. Microfossils represented are mainly foraminifera and palynomorphs but there are also smaller numbers of nannofossil preparations and ostracods. 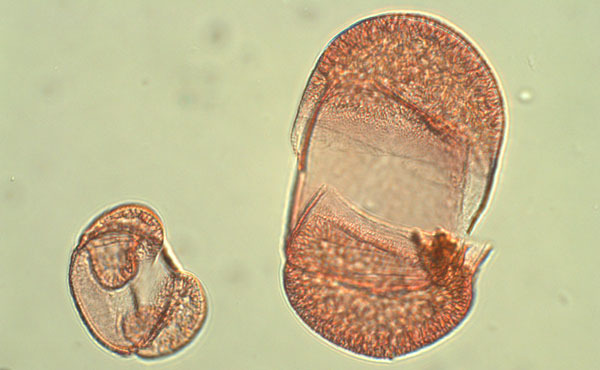 Examples of slides in the Former BP Microfossil Collection from the (A) Well-run, (B) Palynology and (C) NW European Foraminiferal Reference collections. The Reference Collection - BP's "type" collection of slides of individual identified foraminiferal and ostracod specimens. The Well-run Collection - slides of picked microfossil assemblages and residues generated from mainly well cuttings. The Palynology and Nannofossil Collection - microscopic organic and calcareous remains on glass slides. 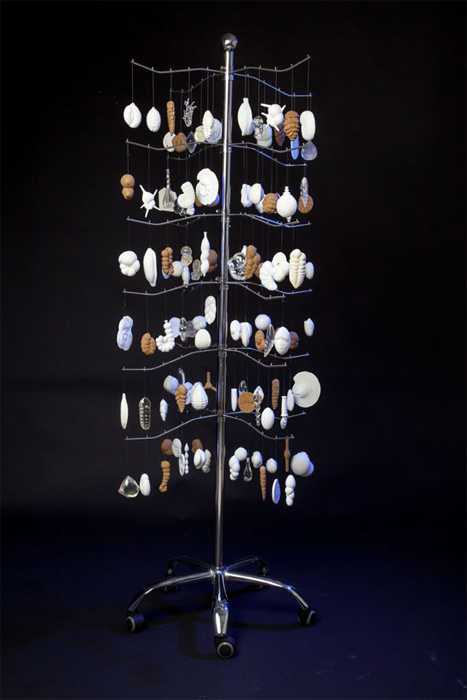 The main users of the collection are currently MSc students supervised by my colleague Steve Stukins doing projects as part of the University of Birmingham course on Applied and Petroleum Micropalaeontology . Funds from the project allow students to travel to London to view the collection and for us to process loans of the material so they can study it in Birmingham for their final projects. Much of the collection has BP-coded identifications (e.g. Species number 12 Subspecies 1) that are referred to in reports currently held by BP. As a result it is difficult to answer very specific enquiries about the collection and a visit to re-examine the material is sometimes the only way to make up-to-date interpretations. 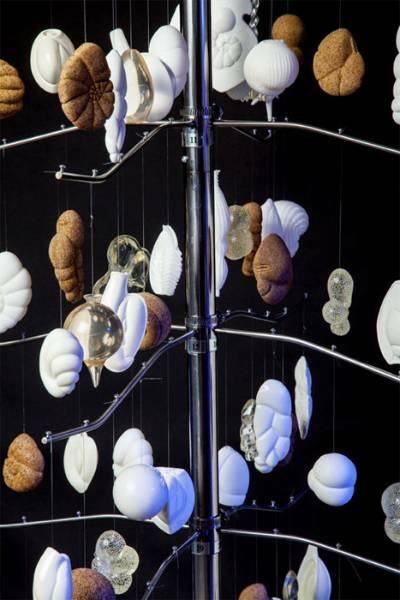 Images of foraminifera from the North West European Reference collection taken by Kelly Smith. As part of the project we have been able to bring in foraminiferal expert Haydon Bailey of Network Stratigraphic Consulting Ltd, a company that mainly specialises in providing micropalaeontological support to the oil industry. He has been providing up-to-date identifications of the material in the collection. Later in the project we will be able to employ a post doctoral worker to synthesise this information with data from well reports. We have been able to purchase a new imaging microscope as part of the project. 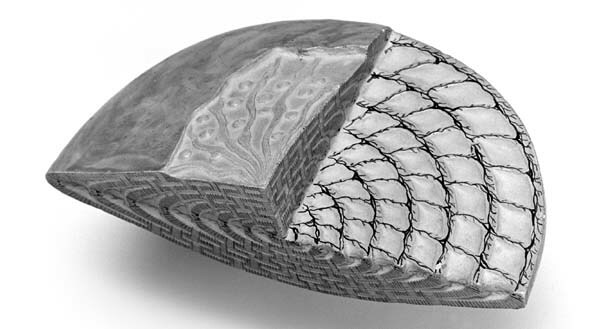 This takes a series of closely focussed images through the depth of each specimen and, using software, combines these slices into a single focussed image. Each of the slides in the North West European part of the Foraminiferal Reference Collection is being imaged and this will be delivered via the Museum's data portal. The data is also being combined into a Geographic Information System (GIS) called PalaeoGIS that tracks the positions of the continents, oceans and seas through time. The interpreted age and palaeoenvironmental data from each well in the collection will be used to identify the relevant GIS time slices on which to plot environments and show images of specimens. "This data has remained confidential for some time, but there is a vast archive of scientific data from as far back as the 1950s that could be re-evaluated using the latest computer modelling technology and the most recent micropalaeontology literature. The development of a global GIS model of tectonics, stratigraphy and palaeoenvironments could also be developed into a valuable resource enabling the public to learn about Earth history." As a curator I hate to think that I have spent a lot of time curating a collection only for it to lie dormant. The six years at the start of my career here at the Museum were spent ordering and documenting this collection so I am really pleased that the research value of the collection is finally being realised by this focussed and innovative project. The BP Project team Robin Whittaker, Giles Miller, Steve Stukins, Tom Hill and Kelly Smith in front of the Nikon SMZ25 microscope. There are literally thousands of potential industrial and academic projects available and this North West European pilot project is a major step towards mobilising the data from this collection. Details of the Former British Petroleum Microfossil Collection can be found online and the collection is available for study by academics, industrial micropalaeontologists or anyone with an interest on request. I was asked to present a short talk at the Houses of Parliament using specimens from the Natural History Museum collections at the launch of the English Geodiversity Charter on 21 October. The charter has been drawn up by the English Geodiversity Forum. 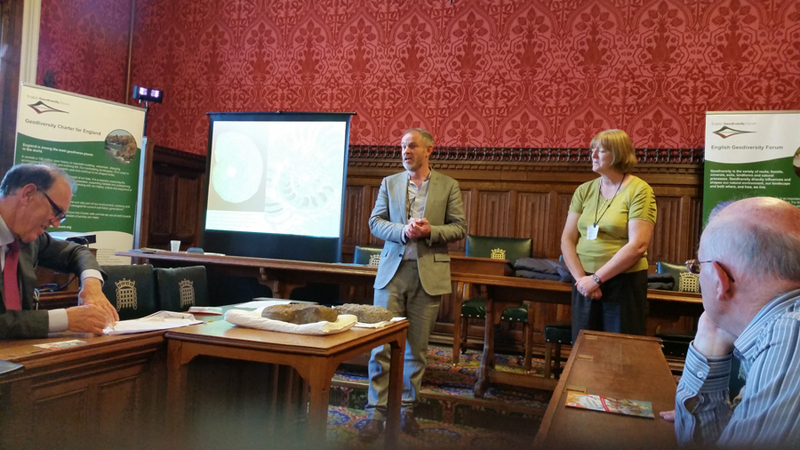 I am currently Chairman of the Geological Curators' Group (GCG), who have been campaigning for examples from museums to be included in the Charter. This post outlines geodiversity, the charter launch and why museums are vital for education about geodiversity. 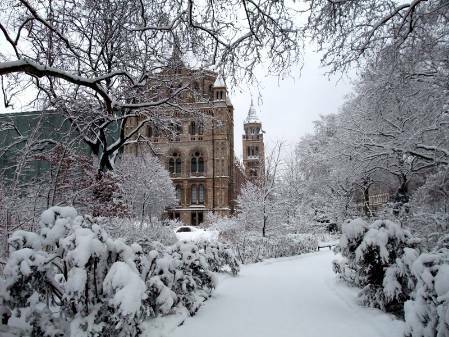 (photo courtesy of Paolo Viscardi, Chairman, Natural Sciences Collections Association). To quote from the Charter: 'Geodiversity is the variety of rocks, minerals, fossils, landforms and soils, together with the natural processes that shape them. Geodiversity is a foundation for life and our society. It influences landscape, habitats and species as well as our economy, historical and cultural heritage, education, health and well-being.' In short, geodiversity underpins biodiversity. Who was at the briefing? 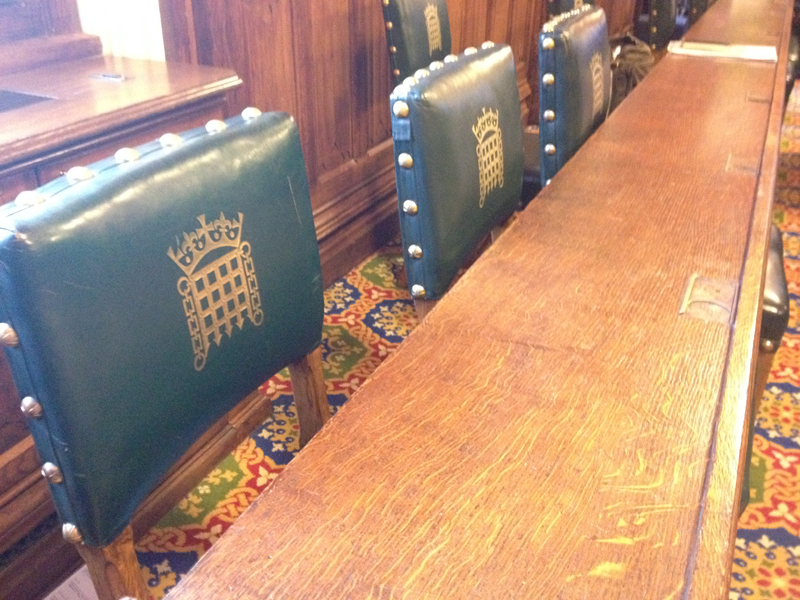 The briefing was convened by Julian Smith MP, opened by Lord de Mauley (Parliamentary Undersecretary for Natural Environment and Science) and was closed by Andrew Sells (Chairman of Natural England). Various MPs had been invited including Kenneth Clarke who was present as his constituency includes Keyworth, Nottingham, the home of the British Geological Survey. Various representatives of the organisations supporting the charter made up a total of about 50 people. The main speakers were Prof Rory Mortimore (Vice President, Geologists’ Association) who spoke on Geodiversity – why it is important?, followed by Lesley Dunlop (Chair, English Geodiversity Forum) on Geodiversity Charter for England and the English Geodiversity Forum. Sam Rose (World Heritage Site Manager, Jurassic Coast Team) – the global importance of England’s geodiversity illustrated through the Jurassic Coast World Heritage Site. Melanie Border (Chair, UK Geoparks Forum) – The importance of Global Geoparks. Rob Palmer (Aggregate Industries) Geodiversity and the Mineral Industry – a personal perspective. Graham Worton (Keeper of Geology, Dudley Museum and Art Gallery) - Dudley Bug – Geodiversity shaping local communities. Giles Miller (Natural History Museum) – The importance of museum collections with an opportunity to view some specimens from the Natural History Museum. 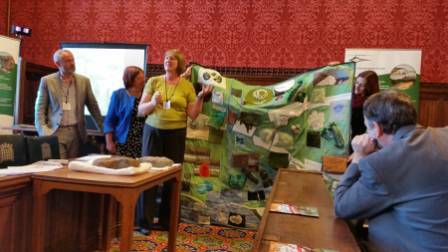 Christine Taylor (Hampshire County Council) - the Hampshire Geological quilt from The Rockband Project. The first rock type I showed in my talk inspired and fascinated me as a child. I would always go to the example on display in the Earth Galleries of the old Geological Museum in South Kensington and stare in wonder. There is still an example of this rock on display that has been shaped like a gravestone to show that the deposit is sometimes called an ammonite graveyard. 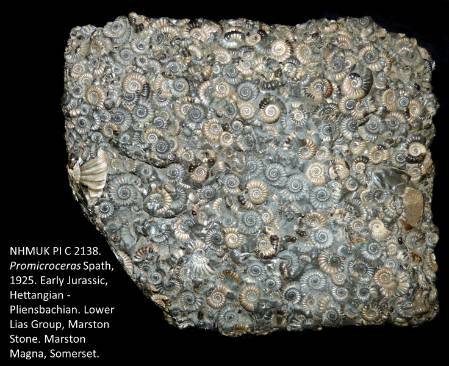 The loan for the ammonite specimens was kindly processed by Zoe Hughes, Curator of Brachiopods and Cephalopods, Department of Earth Science, Natural History Museum. We were worried at one point that the specimens would not be allowed entry to Westminster Palace because rocks are classed as offensive weapons! I cannot pass this display, even if I am rushing off to a meeting, without stopping to look at the specimen and read how these beautiful fossils formed one deposit so many millions of years ago. After joking that I wasn't being very geodiverse by choosing two Jurassic ammonite examples, I lifted up a rather heavy example of an ammonite from the Frodingham Ironstone Formation. 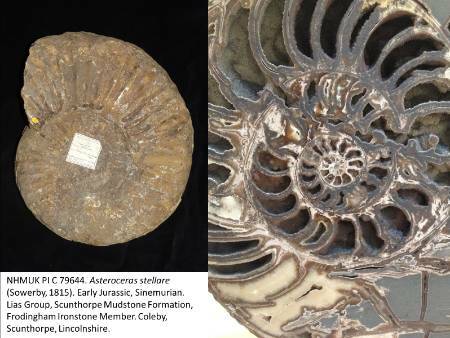 This specimen is unprepared but polished ammonites (like the one below right) from this Jurassic Formation of North Lincolnshire can fetch over £1,000 pounds. The image on the right is a beautiful cut section from the example of this species on display in the Lasting Impressions Gallery at the Natural History Museum. I didn’t chose this example because of its value but because it is relevant to a local issue relating to a North Lincolnshire site known as 'the Rockstore' that was set up by Scunthorpe Museum to showcase the Frodingham Ironstone Formation. This site hosts hundreds of tonnes of Frodingham Ironstone and has been left open for local schoolchildren, geologists both amateur and professional to view and collect the ironstone formation that has had such a major impact on the history of the area. The ironstone was smelted as far back as Roman times. From the 1850s to the 1980s, open cast and subsequently deep mining was carried out until the deposit became unsustainable. Railways opened up to service the area and support the subsequent industrialisation. A local rail and rock museum commemorates this. The Geological Curators’ Group has been alerted to the fact that the local council want to dispose of the rocks and build an industrial estate on the site. We are not suggesting that the estate plans should shelved but we feel that the relevance of the ironstone to the history of the local area merits finding an alternative site rather than the disposal of this important rock formation that is no longer available to collect easily from other sites. My third specimen also had a mining theme to it. It was a vein containing tin, copper and tungsten ore from the Geevor Mine, Cornwall. The brassy parts are chalcopyrite (CuFeS2 ) and the purple iridescent parts are bornite (Cu5FeS4) which are both copper iron sulphides. Mineral-rich veins like these were emplaced in the Devonian age rocks of SW England during the Variscan Orogeny (or mountain-building event) that lasted about 100 million years as the supercontinent of Pangaea formed. The image shows both the unpolished (left) and polished (right) face of this beautiful specimen. The loan for this specimen was kindly processed by Helena Toman, Curator of Ores, Department of Earth Science, Natural History Museum. The main effect of the Variscan on SW England was the underground emplacement of a giant granite mass called the Cornubian Batholith about 290 million years ago. While the magma was still hot, minerals became concentrated in hot liquid that migrated and then solidified in veins of tin, copper, iron, zinc, lead, silver and arsenic ore. These have been extensively mined and left an indelible legacy on the local community and history of the area. The granites continue to dominate the area as they underly large moorlands such as the Bodmin Moor and Dartmoor. Quarries have produced distinctive granite building stones and the weathered margins of the granite have also produced local china clay. Finally, Christine Taylor from Hampshire County Council brought along a geological quilt. A group of museums in SE England recognised that they lacked specialist knowledge about geology and their geological collections so formed a HLF funded partnership called Rockband. Christine Taylor (Hampshire County Council) demonstrating the quilt showing the geological map of Hampshire (photo courtesy of Paolo Viscardi, Chairman, Natural Sciences Collections Association). The Geological Curators’ Group was particularly interested in this project because it is a very nice example of sharing skills and knowledge via museum collections. Local geological experts were brought in to devise new geology sessions that have enabled members of the public to understand the relationship between the geology of the local area, building stones and the natural landscape. Each partner was provided with a bespoke textile geological mat designed to communicate the geological structure of the area. Pockets house examples of local rocks and fossils linked to stories based on the local geological history. These mats were particularly designed for blind and partially sighted people but were relevant to all visitors. It was an extremely successful launch of the Charter and was a great first step in achieving the aims of the English Geodiversity Forum which are to: encourage ‘action’ for geodiversity, raise awareness of geodiversity, promote and share good geoconservation practice, and advocate policy inclusion of geodiversity at all levels. It will be interesting to see how we can build on this first step in the light of a forthcoming general election and the lack of geological topics on the national curriculum. Clearly museum collections and displays play a vital role in educating the public about geodiversity so the GCG look forward to working closely with EGF in the future. And how does this all relate to my role as a micropalaeontology curator? This week I was officially told that my role will change and I will become a collections manager in charge of three members of staff covering the micropalaeontology, petrology and the ores collections. 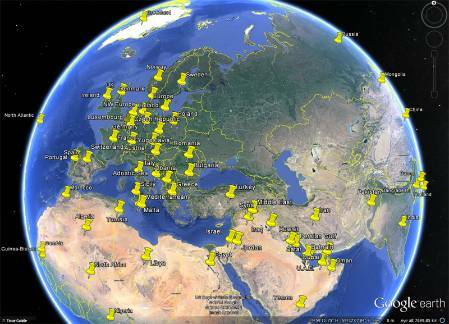 As well as this management role moving me further from hands-on-curation, my job is certainly becoming more geodiverse! This week I 'claim an assist' at the start of the football season, visit the lab where David Attenborough once dropped his camera into a vat of acid, move a microfossil tree across the Museum, am reminded how difficult it is to place a monetary value on microfossils and manage to retrieve an important file in preparation for a talk to a local society. In footballing terms you'd call this 'claiming an assist'. In 1995 I wrote an article in the Palaeontological Association Newsletter advertising the Former BP Microfossil Collection that I was curating at the time. This alerted Prof. Paul Pearson to our collections, he arranged a visit and found some exceptionally preserved material. His subsequent drilling projects at the same sites in Tanzania have provided some amazing material, both foraminiferal and nannofossil that have made a major contribution to the science of micropalaeontology and have been the basis for the careers of several young researchers making their way in academia. The holotype specimen of Hantkenina singanoae. Coxall & Pearson, 2006. Today I am registering some type material Prof. Pearson donated us from his Tanzania work. These type specimens have been published in three key papers in 2004, 2006 and 2014 but the material is currently part of our backlog for computer registration. Most journals require published material to be deposited in museum collections and this remains one of our key methods for collections development. News of a backlog should not put off potential donors to our collection though. Pretty much every museum has a backlog and it is my priority to register this material, particularly if it has been published. I'd argue that it is better to be in this backlog, safely housed in the Museum and available for study than to be hidden in a drawer in a university office. This morning I am alerted to a new paper on Research Gate, which is a kind of Facebook-for-academics highlighting the latest work by your peers. This 2014 paper provides new evidence that shows the main conclusion of my 1993 thesis is no longer valid. My job allows me 10 percent of my time to carry out research projects and today this takes me to the acid lab in the basement to dissolve microscopic teeth called conodonts from Permian limestones from Oman. The aim is to provide dates for other studies where new trilobites and other macrofossils have been found. The acid laboratory at the Museum. My 3kg limestone samples are in the second bay along in small boxes like the one on the floor to the left. 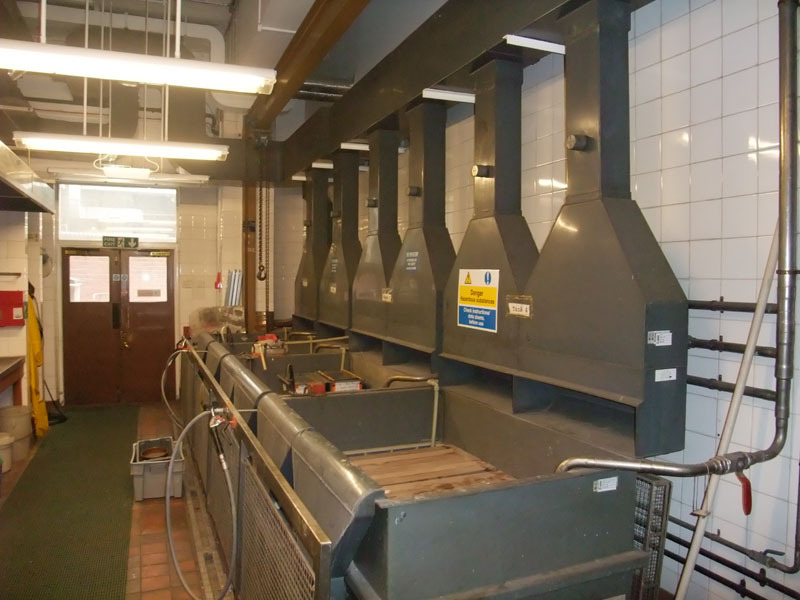 The laboratory is designed for preparing large vertebrate specimens by dissolving them in acetic acid (vinegar) and was most famously used by David Attenborough in his programme Life on Earth. During the filming of a time lapse series of pictures showing one of these dissolution experiments, Sir David apparently dropped his camera into the vat of acid. 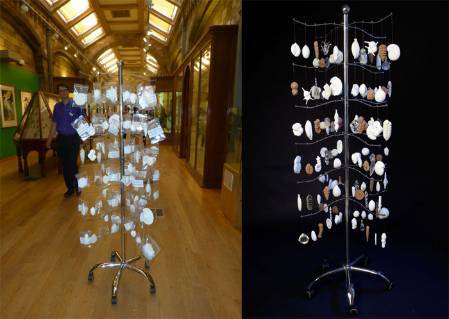 Our Zheng Shouyi microfossil tree is to be photographed in the photo unit today so first thing I place the hanging microfossil models in plastic bags to prevent them from bashing into each other as the tree is wheeled through the gallery. It takes 15 minutes to move a short 20m distance through the Bird Gallery because members of staff on their way into work keep stopping me and asking about it. The Zheng Shouyi microfossil tree, complete with plastic bags to prevent damage during transit (left) on its way through the Bird Gallery and (right) after its photoshoot. When I get to the photo unit, photographer Kevin Webb is surprised because he had been told it was a fossil tree and was expecting some fossil wood! I bump into another member of staff who says they have heard about the tree at a Science Uncovered briefing but didn't realise it wasn't a real tree either, so I send some of Kevin's photographs to them for distribution. As I can't wheel the tree back through the gallery during opening hours I have to collect it early the next day. It takes even longer to get back through the Bird Gallery as there is a considerable amount of interest in the tree. This bodes well for our desk on the Climate Change Station at the forthcoming Science Uncovered Event on 26th September when I will be joined by my colleagues underneath the cocoon of the new Darwin Centre. The rest of the day is spent dealing with two loan requests, firstly for long term visitor Yukun Shi who has requested some of our larger benthic foraminifera for CT scanning. Another loan involves some specimens I computer-registered in 1994 but requires some thought as we are required to put a valuation on any material we send out on loan. 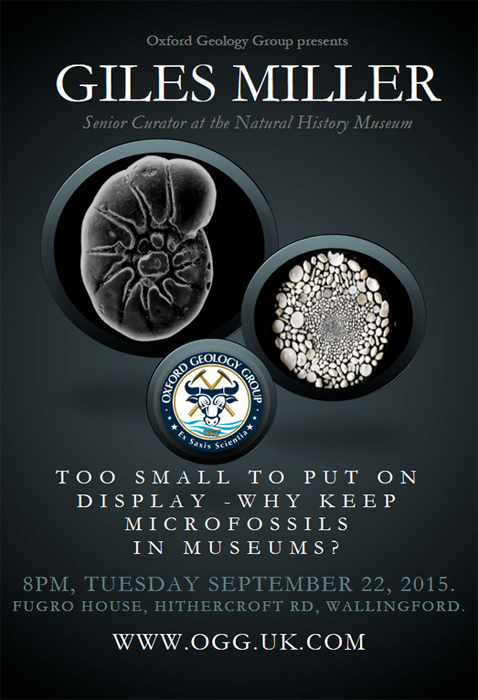 It reminds me how difficult it is to value microfossil specimens when there is little commercial market for them. An email today reminds me that a little over a year ago I agreed to give an evening talk to the Harrow and Hillingdon Geological Society. Over the last few years I've given similar talks at St Albans, Horsham and Hertford. I look for the powerpoint file for the talk that had been prepared for another venue but the folder on my hard drive has corrupted, as has the folder on my back-up hard drive. After a few moments of panic I find another copy of the file on the pen drive that I'd used when I last gave the talk. An Oxford Geology Group advert for a talk I recently agreed to provide in 2015. My colleague and fellow NaturePlus blogger Dr Erica McAllister is asked to give talks like these all the time. A few months ago I asked her if she ever gets choosy and says no? She said she always says yes if she can, in fact on one day she once gave three! If you have some spare moments then why not check out Erica's blog or read my colleague Mark Graham's guest post where he describes hosting a recent visit from Sir David Attenborough including a trip to the acid lab. 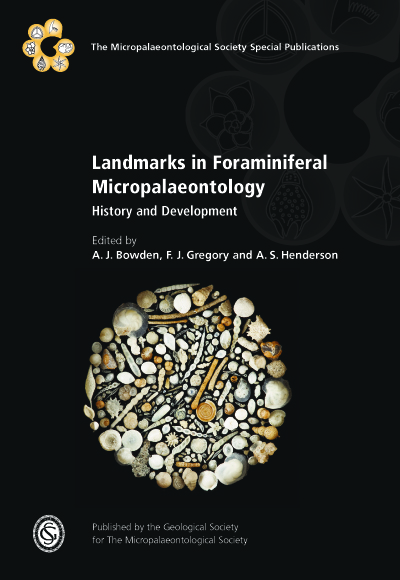 One of my curatorial predecessors Randolf Kirkpatrick (1863-1950) thought that larger benthic foraminifera (LBFs) were so important that he published a theory that they were vital to the formation of all rocks on earth. Our collection of LBFs has received relatively little attention over the 20 years I have been at the Museum, but recently it has been the most viewed part of the microfossil collection. Some images of larger benthic foraminifera (LBF) taken by Antonino Briguglio, a recent SYNTHESYS-funded visitor to our collections. The images represent specimens roughly the size of a small fingerprint. Traditionally LBFs have been difficult to study but new techniques, particularly CT scanning, are changing this perception. This post tells the story of Kirkpatrick and explains how the collection is currently being used for studies in stratigraphy, oil exploration, past climates and biodiversity hot spots. Larger benthic foraminifera are classified as microfossils because they were produced by a single celled organism, but they can reach a size of several centimetres. Their study is difficult because it usually relies on destructive techniques such as thin sectioning to make precise identifications. My first line manager at the Museum Richard Hodgkinson was an expert at producing these thin sections. He described the technique of cutting the specimens exactly through the centre as an art rather than science. Sadly there are very few people in the world skilled enough to make these sections, but thankfully the Museum collection is packed with LBF thin sections available for study. 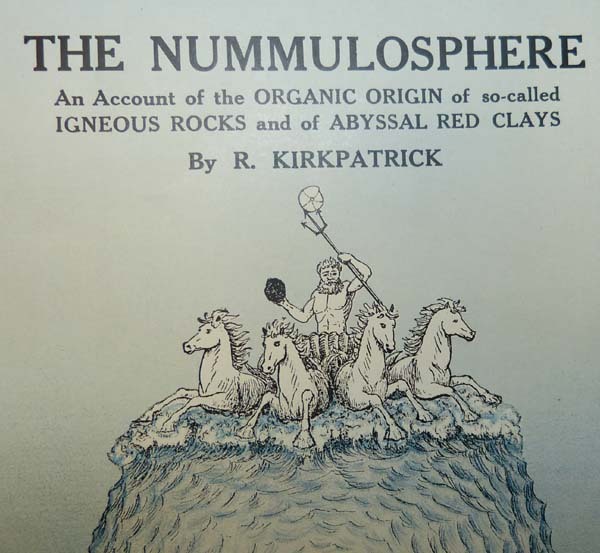 Kirkpatrick developed a theory that at one stage Earth was covered with water and LBFs of the genus Nummulites accumulated into a layer he called 'The Nummulosphere'. He went on to suggest that all rocks we see now were subsequently derived from this nummulosphaeric layer and he figured examples in his books of supposed nummulitic textures he had seen in granites and even meteorites. I think that Kirkpatrick would be very interested to hear that scientists are looking for evidence of life on Mars and that meteorites may hold the key to this. Obviously the evidence of life, if it arrives, is almost certainly not going to be a LBF. However, I think that if he were alive today, Kirkpatrick would be very interested to hear of the renewed interest in our LBF collection and that his earlier publications on sponges have also received renewed interest. These publications had been largely ignored because of his later publications of the Nummulosphere theory. Image of palm-sized model of a nummulite made in plaster of Paris based on an original illustration by Zittel (1876), showing strands of protoplasm colonising its complex shell. Find out more about Kirkpatrick from the Museum Archives or read the article entitled 'Crazy Old Randolf Kirkpatrick' by Steven Jay Gould in his book The Panda's Thumb: More Reflections in Natural History. Read on to find out about some of the projects that the collection has been used for. Naturalis Biodiversity Center researcher Laura Cotton studied for her PhD in the UK and has been a regular visitor to our LBF collections. She borrowed some rock sample material from Melinau Gorge in Sarawak, Malaysia that was worked on by one of the leading LBF workers of the time, former Natural History Museum Palaeontology Department Associate Keeper Geoff Adams (1926-1995). It would have been almost impossible to arrange for this material to be recollected. In a study published earlier this year, Laura carried out destructive techniques on these samples to release whole rock isotope data that has provided information about the position of an isotope excursion that relates to a period of global cooling and climate disruption. Laura showed that an extinction of LBFs previously described by Geoff Adams occurred prior to this isotope excursion, a situation she had previously described in Tanzania. This suggests that this Eocene-Oligocene extinction of LBFs is a global phenomenon, closely linked to changes in climate around 34 million years ago. Boxes at our Wandsworth stores containing samples from which much of our larger benthic foraminifera (LBF) collection was obtained. Please note that the temporary box labels in this 2007 picture have now been replaced! Most of our micropalaeontology rock sample collections are housed at our Wandsworth outstation and this project is a very good example of how duplicate samples are valuable resources for later studies using new techniques. Naturalis researcher Willem Renema has been studying LBFs from SE Asia as part of a large multidisciplinary group including my colleague Ken Johnson (corals). The 'coral triangle' situated in SE Asia contains the highest diversity of marine life on Earth today. Back in time, water flowed from the tropical west Pacific into the Indian Ocean (Indonesian Throughflow) but this closed during Oligocene - Miocene times roughly 25 million years ago. This interval in geological time is characterised by an apparent increase in reef-building and the diversification other faunas including the LBFs and molluscs, leading to the formation of the present day 'coral triangle'. The project aims to investigate how changes in the environment led to the high diversity of species present today. Some slides from the Geoff Adams Collection from SE Asia scanned by Malaysian intern student Zoann Low. Our LBF collections are very strong from this area of the world following the work of Geoff Adams. Two curatorial interns Faisal Akram and Zoann Low from Universiti Teknologie PETRONAS in Malaysia have helped greatly to enhance this area of the collection by providing images and additional data relating to Geoff Adams' collection and allowing us to prepare data to be released on the Museum data portal and for this 'coral triangle' project. One of our most important collections, the former Iraq Petroleum Collection contains many LBFs that help to define the stratigraphy of oil bearing rocks of the Middle East. Some significant early oil micropalaeontologists such as Eames and Smout of BP also contributed to the collection. 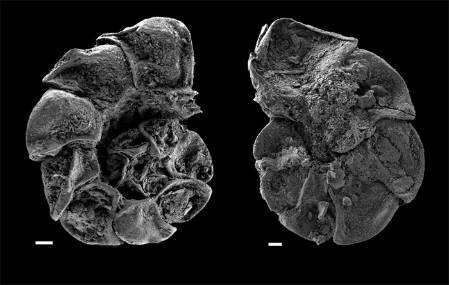 Recent donation from Oman of some Permian larger benthic foraminifera (LBF) of the genus Parafusulina. A major publication on the collection by Museum Associate John Whittaker and others is being updated by John and a team of scientists including our own Steve Stukins and Tom Hill. We look forward to seeing this published in a major book in the next couple of years. CT scanning has opened up a whole new method for studying LBFs and made it much easier to create virtual sections through specimens without the need for expert and time consuming thin sectioning. We hope that our collection can be an excellent source for those wishing to CT scan LBFs and recently we were in negotiations with long term Museum visitor Zukun Shi who is studying fusuline specimens like the ones illustrated on my hand above. This collection may never be as important as Kirkpatrick thought it was. However, it is a really excellent example of one that has become more relevant recently as new techniques are applied to its study. Who visits our behind the scenes collections and why? How do our visitors know what's here and why do they arrange visits? The microfossil collections are not on display in the Museum galleries and many people are unaware that we have such large collections behind the scenes. 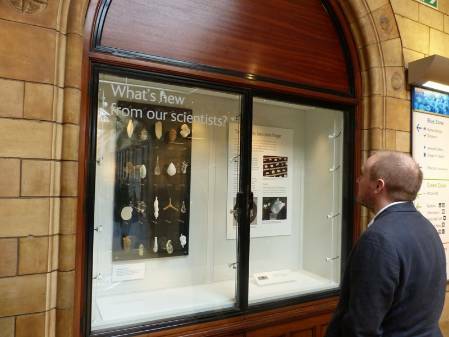 Despite this, last year I hosted over 300 visitors to our microfossil collections. A selection of books and monographs, mainly published in the last 6 months, which illustrate and provide details of over 1,000 of our specimens. In this post I provide some ranked lists covering the questions 'How do visitors know about our collections?' 'Who are they?' and 'What do they do when they visit the microfossil collections here at the Museum?' Finally there is an interactive panoramic shot of the view most visitors see as they enter our collections. How do visitors know about our collections? Scientific publications that refer to our collections. I have rated this as the highest factor and many enquirers request to see material that has previously been published, particularly when images in older publications do not provide enough information. Modern techniques for imaging including scanning electron microscopy have helped with this, but often there is no substitute for being able to view the specimen down the microscope yourself. Reputation/strength of the collection. There are some collections at the Museum, for example the fossil fish collection, where this factor would be at the top of the list. However, I think this factor is not as strong with the microfossil collections as it is often easier for researchers to go and collect their own material to work on. Online presence (blogs, Twitter, online catalogue, listservers). This was not previously a driving force in pointing potential visitors to our collections, mainly because so little electronic information was available online. Our collections are now well-represented online and this is an increasingly important method for advertising our collections. Advertising by staff word-of-mouth. When I first came to the Museum we had four research micropalaeontological staff here who would be attending conferences all over the world and would often encourage visitors to the collections. This factor is less significant now but still very much part of our remit. Researchers from universities or other research establishments. These are the main users of our collection and probably always will be. Grant-funded visitors e.g. SYNTHESYS. These could be counted under the heading above but they make up an increasingly large proportion of our visitors and a major grant from the EU provides us with funds to support their visits. Students. These are mainly undergraduates and postgraduates, some of whom are supervised by myself, Steve and Tom. Scientific Associates and long-term visitors. Retired former members of staff or retired academics who use our facilities make up the majority of these visitors. Volunteers/work experience. We currently have several volunteers. Details of volunteering opportunities are available on the Museum website. Commercial enquirers. These are usually from oil companies, mining, environmental or archeological consultancies. Local enthusiast groups. These are mainly local geological societies. Artists. This category is a new entry but is rapidly rising up the list. Media. Occasionally journalists visit us, but not as often as we would like. Dr Steve Stukins giving a tour for MSc students from the University of Birmingham Applied and Petroleum Micropalaeontology course during the recent Micropalaeontological Society conference held at the Museum. Pop in for very short visits while or before attending major meetings at the Museum or elsewhere in London..
Work on research or curation projects with members of staff. 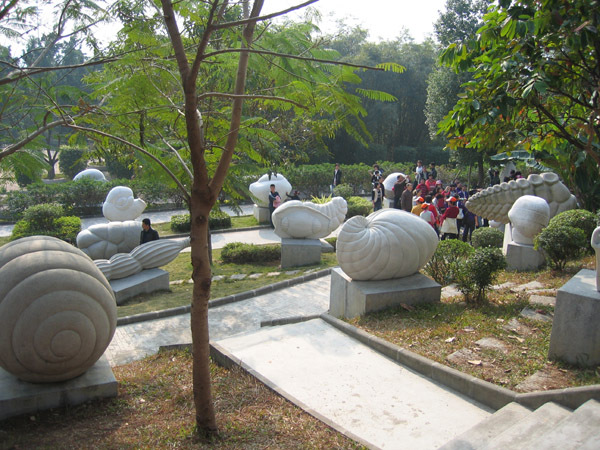 Attend tours arranged usually for university students or local geological societies. Deposit specimens or return loans. Use the Heron-Allen Micropalaeontology Library and other facilities. The image above is part of a panorama of the Museum's Heron-Allen Library, where we host our visitors. Most of our micropalaeontological collections are held here, along with a world-class collection of micropalaeontological books. The mahogany door you can see in the panorama is one of a pair from the entrance to Edward Heron-Allen's library at Large Acres, Selsey. The house is sadly now demolished. Hopefully this has answered the question 'who visits our behind the scenes collections?' You may think that the short list I provided does not give exact details of how visitors use our collections. More details can be found in other blog posts I have written on ocean acidification, ancient climates, climate change, early humans in Britain, dinosaurs, exhibitions, students, volunteers and artists. 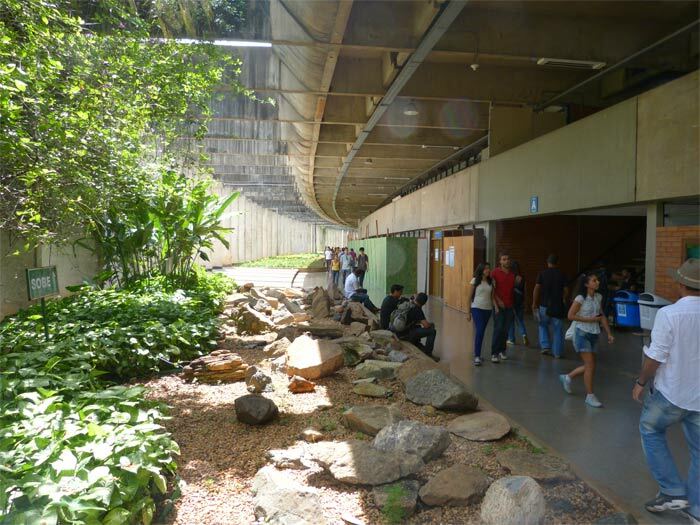 This March I taught a course on collections management at the University of Brasilia (UnB) in the capital of Brazil. 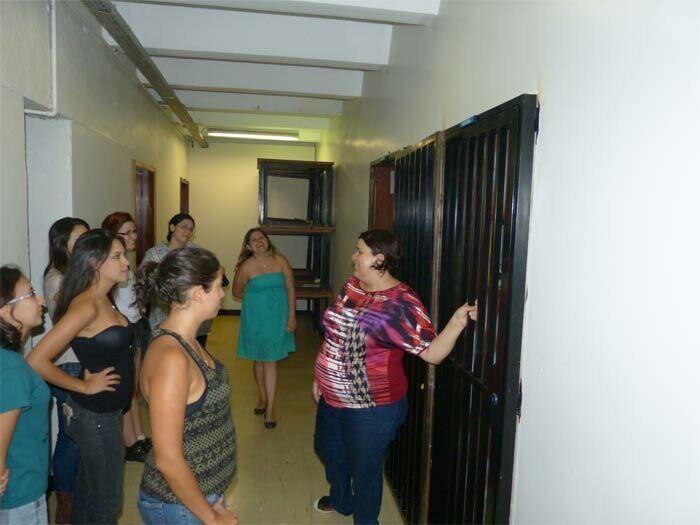 The class included both undergraduate and postgraduate students studying Geology, Museology and Art, mainly at UnB. 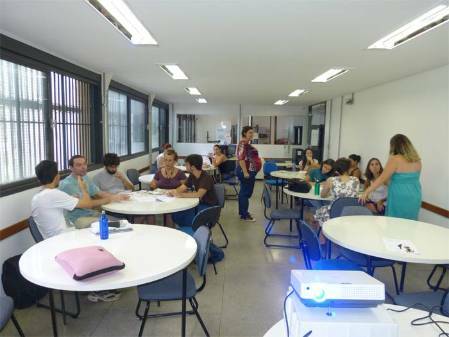 This is the third time that I have presented a similar course in Brazil with previous courses delivered at UnB and the Museu Goeldi in Belem. After the course I asked the students 'what was the most important thing you learned?' To illustrate the course contents, a summary of their answers is included here. There is also a picture of some of the less friendly Brazilian inhabitants I encountered! 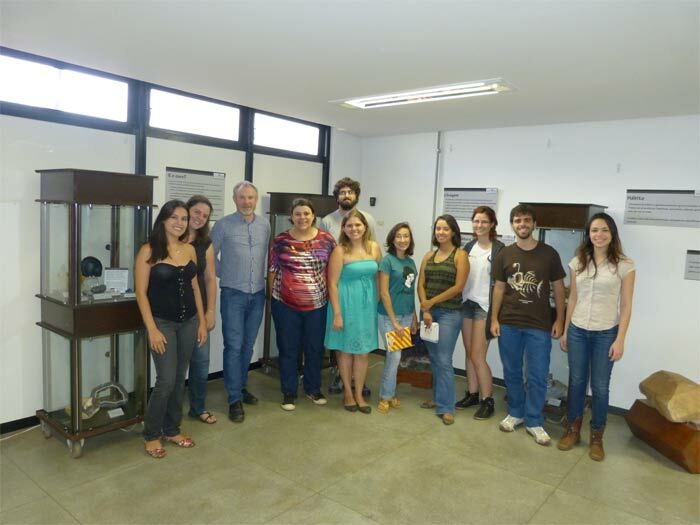 Me with some of the class in the display area of the Museum of Geosciences at the University of Brasilia. 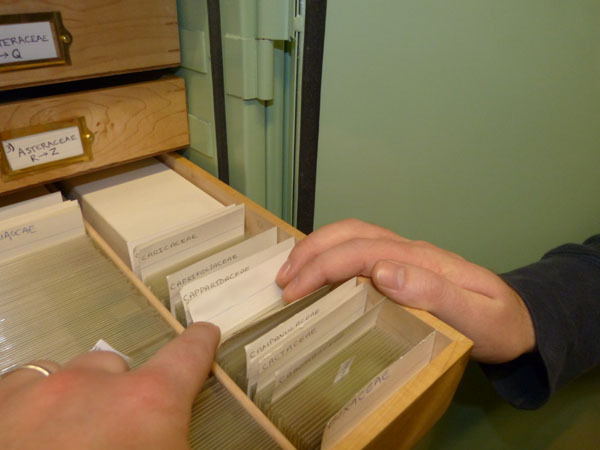 The course draws on examples from my 20 years of experience in managing microfossil collections, but the principles covered are relevant to the management of a wide range of natural history collections. Previous classes have included entomologists, botanists and zoologists. 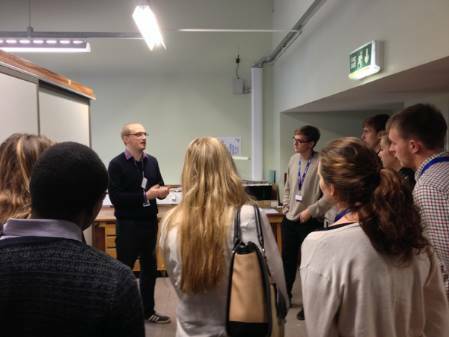 This time many of the course participants were museology undergraduate students wanting to find out about managing scientific collections. Just outside the Museum of Geosciences, University of Brasilia. This was my third visit to the university but it was the busiest and noisiest. It was Freshers Week so there were lots of noisy events including a student initiation just outside the window of the lecture theatre! Rather than providing a dry summary of the course, I thought that I would precis/summarise some of the student feedback. I was also pleased to find that the students said I was understandable, delivered the course well and provided a good balance of lectures and practicals. Big and small museums face the same issues. Curators must work hard to publicise and advocate their collections to maintain their relevance. How to plan before acquiring objects for your collection. Collections development and conservation plans are important. Why it is important to try to register everything in your collection. Thorough labelling and documentation is important because you don't know how a collection might be used in the future. Data standards are important to help organise and manage a collection. What the risks are for a collection and how they can be avoided. The class discussing collections development ideas. 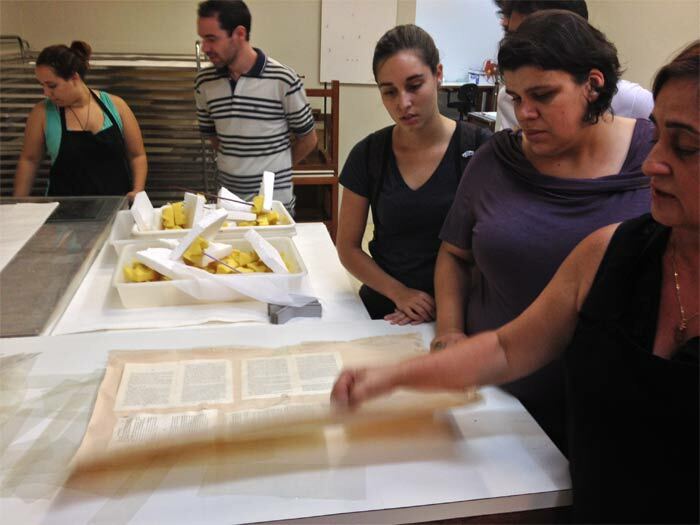 A trip to the UnB library to see the paper conservation unit. A visit to the geology collections with Dr Maria-Julia Chelini. The students affectionately call this basement corridor The Dungeon! The amazing view from the country house of Dr Dermeval do Carmo who invited me to give the course and looked after me so well during my visit. Finally I would like to quote directly from feedback of one of the students Anna Maria Amorim de Oliveira who neatly summarises the benefits of providing courses like this and makes reference to the fact that it wasn't just me talking all the time. We had some really great discussions too! On 13 Feb a new temporary exhibition opened here at the Museum entitled Britain: one million years of the human story. It includes some images of microfossils from our collection in the display. Scanning electron microscope (SEM) images of pollen grains from our collection that appear in the exhibition. These and other microfossil collections housed behind the scenes help with dating the finds, reconstructing the environment, landscape and climate of these first human settlements in Britain and provide the climatic context for the recent discovery of the earliest human footprints in Britain on a Norfolk beach. The exhibition highlights the work of the Ancient Human Occupation of Britain (AHOB) Project and its predecessor projects. The current project, funded by Calleva, is investigating the timing and nature of human occupation of the British Isles, the technology they used, their behaviour, the environment they lived in and the fauna sharing the landscape. The microfaunas and floras mentioned here were recovered by project researcher Mark Lewis and project associate member John Whittaker. Mark is a palynologist and has used the distribution of pollen grains in the sediments surrounding the human finds to interpret ancient climates and landscapes. Pollen grains that range in size from 10-100 microns can be found in sediments millions of years after the plants that produced them have died and decayed. Mark regularly uses our collection of modern pollen and spores to interpret the pollen floras that he recovers as part of the AHOB Project. We recently transferred this collection from the Botany Department and the images in the exhibition were taken from the collection of SEM prints and negatives that accompanies that collection. Part of our modern pollen collection. Slides are housed in special plastic sleeves and arranged by plant family name. John Whittaker spent his entire career as a researcher here at the Museum and is a now a Scientific Associate in the Earth Sciences Department as well as being an Associate Member of the AHOB Project. 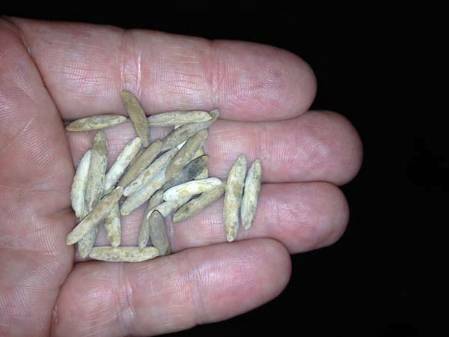 In a previous blog post I highlighted his microfossil finds from three key early human sites at Boxgrove about 500,000 years old, Pakefield about 700,000 years old and Happisburgh (prounced Haze-boro) about 900,000 years old. Many of John Whittaker's microfossil slides are deposited here at the Museum. Ostracods and Foraminifera collected by John Whittaker from Boxgrove indicate a marine raised beach and a later terrestrial deposit with freshwater ponds below chalk cliffs. 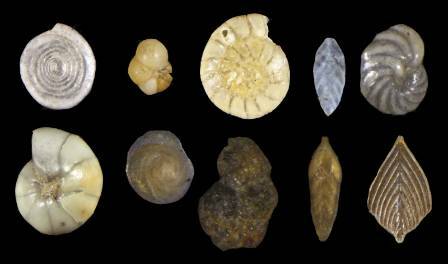 The saltmarsh foraminiferal species Jadammina macrescens has been recovered from Happisburgh and is consistent with interpretations that the site is situated near the mouth of the ancient large river, possibly the River Thames. The foraminiferal species Jadammina macrescens is common in saltmarsh environments. 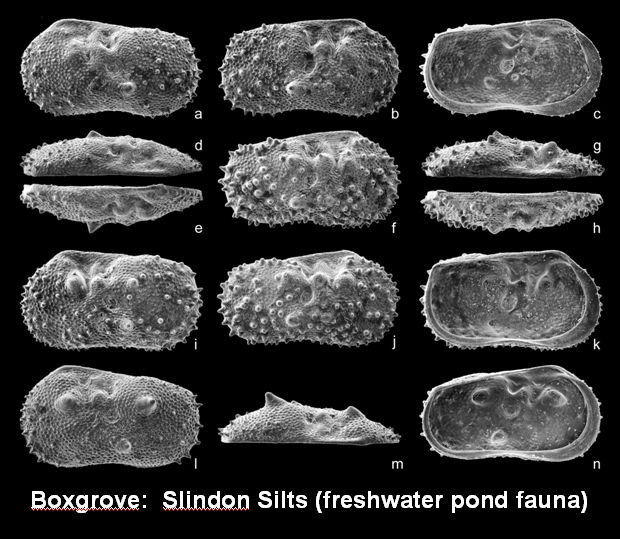 The microfossils were able to show that the Slindon Sands were deposited in a wholly marine high-energy environment, whereas the Slindon Silts were deposited in a shallow intertidal environment at the margin of a regressive sea. This sort of information is vital when interpreting the archaeological finds from the site. 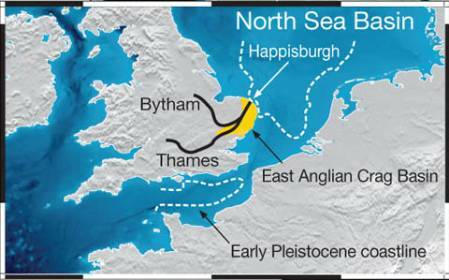 River sediments containing flint artefacts have been found on the coast of East Anglia at Pakefield. 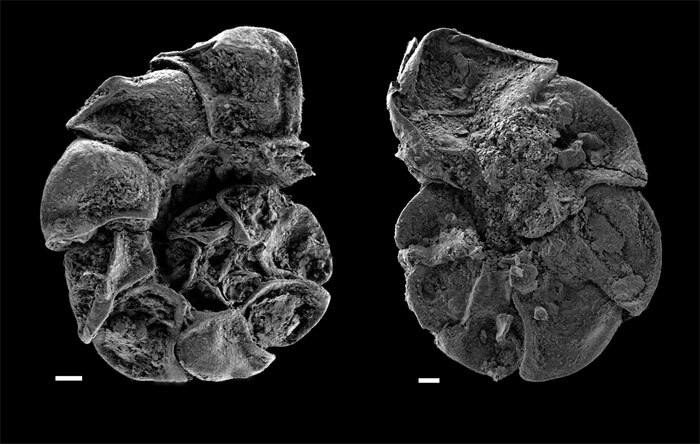 The oldest artefacts came from the upper levels of estuarine silts where both marine and brackish ostracods and foraminifera have been recovered. Other evidence from mammal, beetle and plant remains suggests a setting on the floodplain of a slow flowing river where marshy areas were common. The river sediments were deposited during a previously unrecognised warm stage (interglacial) and the presence of several warmth loving plants and animals suggests that the climate was similar to that in present day southern Europe. Pollen and mammal fossils recovered from Happisburgh suggest that the climate was similar to that of southern Sweden and Norway of today with extensive conifer forest and grasslands. The floodplains were roamed by herds of mammoth and horses. Foraminifera such as the species Ammonia batavus are characteristic of warmer climates. The interglacial sediments at Pakefield are overlain by a thick sequence of glacial deposits which include till and outwash sands and gravels. These contain reworked (Cretaceous and Neogene) microfossils transported from the North Sea Basin by glaciers. This is important information as fossils found in these redeposited sediments could be give false indications as to the climatic setting and dating of any finds. The dating of the deposit at Happisburgh is provided by a combination of mammoth, horse, beetle and vole finds as well as the Middle Pleistocene ostracod Scordiscia marinae. Work by John Whittaker and the AHOB team at a number of other Pleistocene sites across the SE of Britain has increased the potential of ostracods as tools for dating these sediments. characteristic of the Middle Pleistocene period. An example of a microfossil that is useful for dating sediments. A flint handaxe recovered from sediments recently exposed on the foreshore at Happisburgh provides part of the evidence for the earliest human occupation of Britain. Several other Palaeolithic sites have since been discovered there including sets of early human footprints on the foreshore that made the national news at the time of the opening of the exhibition. Pine (Pinus) and spruce (Picea) pollen recovered by Mark Lewis from the sediments that preserved the Happisburgh footprints. Pollen analysis of the sediments adjoining the footprints revealed the local vegetation consisted of an open coniferous forest of pine (Pinus), spruce (Picea), with some birch (Betula). There were some wetter areas where Alder (Alnus) was growing; patches of heath and grassland were also present. These all indicate a cooler climate typical of the beginning or the end of an interglacial recognised at other Happisburgh sites. I would recommend that you come and see the exhibition Britain: one million years of the human story if you can, before it closes at the end of September. If you can't then there are a wealth of interesting items on the Museum website including a video showing the recently discovered footprints. Quite rightly the artefacts and larger fossil materials collected from these early human sites in Britain dominate the exhibition along with the amazing life-sized models like 'Ned the Neanderthal'. 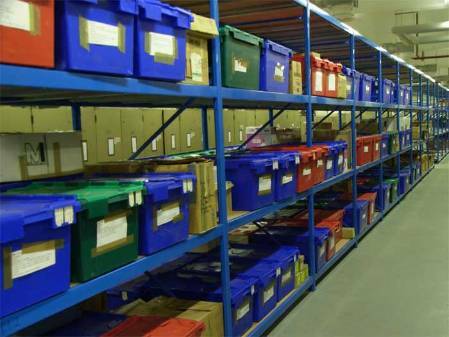 Hopefully this post has shown that there are many other undisplayed collections held behind the scenes here at the Museum that are just as important in telling us how, when and where the earliest humans lived in Britain. What can Twitter do for our collection? From 1 December we tweeted a picture of one of our microfossil Christmas card themed slides every day until Christmas in a successful advent series. This brought our collections to a new audience and showed that reaching a wider exposure on Twitter is reliant on retweets from major players such as the Museum's main account, @NHM_London, and good timing of tweets. Other factors included the relative aesthetic beauty of some slides compared to others and may have reflected the skill of the slidemakers concerned. 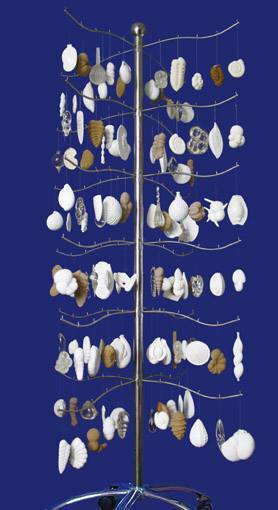 Some of the Earland and Heron-Allen Microfossil Christmas Card images tweeted last December. Not all my readers will be familiar with Twitter so here is a short summary of how it works. Users post online pictures and/or text of no more than 140 characters. Each user decides who to follow and can choose to read a feed consisting of all the messages posted by other users that they follow. If someone posts a message that looks interesting, it can be flagged as a 'favourite' or be 'retweeted' and re-sent to all your own followers. Users can post replies to messages, engage in conversations or search for subjects being discussed under a particular hashtag (we used #microfossiladvent). How did it work for us? We had over 450 retweets for our pictures and gained 150 new followers to our feed. Before we started, we had about 450 followers to our twitter feed that we had been running for about a year. The increase in followers by 150 in less than a month was therefore significant, and the trend in the increase in our number of followers has reduced to a steady trickle since then. Why were some tweets more successful than others? It was immediately obvious that two main factors were responsible for enhanced interest in the pictures, firstly weekend tweets hardly ever got retweeted compared to the weekday ones. The second and most striking correlation was that pictures retweeted by @NHM_London had significantly more retweets than all the others. This feed is followed by nearly 500,000 people so this is hardly surprising. Three more tweeted images, all roughly the size of a thumbprint in real life. The middle one was most popular as it was retweeted 45 times and caused my phone to buzz continuously in my pocket for a couple of hours during a meeting! Another issue we considered was whether some images got retweeted because they were more visually appealing than others? Half the slides tweeted were made by Arthur Earland and the other half by Edward Heron-Allen. Was one maker more adept at making pretty slides than the other and got more retweets? (For details of their relationship and more information about these slides see my post on Microfossil Christmas Cards). We found that, taking into account the issues stated above, Earland's slides were on average twice as popular as Heron-Allen's. Who is our Twitter audience? Usually we would make our collections available to academic enquirers who would request a visit, a loan or send an enquiry for details about the collection. Twitter has opened up a completely new audience. Some of our academic stakeholders do follow us but they are in the minority and many on our list of followers will never visit the Museum because they live too far away and even if they did, they wouldn't see any of our microfossil collection on display. What has it done for our collection? If you consider the traditional 'key performance indicators' (KPIs) of visitor days, numbers of specimens loaned and enquiries, then Twitter has done very little for our collection that can be measurably demonstrated. What it has done is to bring the collection out to a new audience, making it available and relevant much more widely. Has this engagement been little more than having a number of people agree that pictures of our collection are pretty? Possibly. Can this engagement actually be measured? What can Twitter do for us? An interesting post on the London Museums Group site by Digital Analyst Elena Villaespesa looks at quantifying the impact of Twitter on an exhibition at the Tate Modern. They have used Twitter as a communication tool to engage in conversation with visitors and research their audience. To do this they have analysed the number of comments under a certain hashtag as well as the number of visitors who participated with meaningful responses. Social media analysis software is available to help with these analyses if there is a large amount of data. In a previous blog I looked at the benefits of blogging about collections and showed that it has enhanced the profile of the collection in the national press, helped with its management, encouraged donations, enabled fundraising and produced research collaboration offers. Looking at our Twitter feed over the last year we can point to examples of all these 'traditional KPI related' outcomes. However, I think that with our advent Twitter campaign we have built an excellent platform for measureable future engagement. Looking at numbers of retweets we are receiving is a good sign but there is much more we can do in future by engaging in conversations with a wider audience. An example of an interaction that followed a #FossilFriday tweet of a specimen from our collection. Whether you follow Twitter or not you can see all the messages posted by us on our NHM Micropalaeontology Twitter feed and learn more about how museums use social media by looking at the London Museums Group site (see a guest post by fellow NaturePlus blogger, Librarian Hellen Sharman). If you are a Twitter follower then why not check out our contributions to #FossilFriday or keep up to date with micropalaeontology collections, research and teaching by following us @NHM_Micropalaeo. Old and new microfossil Christmas cards! Last year our 100-year-old microfossil Christmas cards were featured in The Independent newspaper and on the Science Focus website. On 30 December I am presenting a Nature Live on the microfossil Christmas cards at 12.30 and 14.30 so if you are in the area, please do pop in and say hello. If you don't live near London then follow us on @NHM_Micropalaeo as we are tweeting an image of one of our beautiful Christmas microfossil slides each day of December until Christmas. 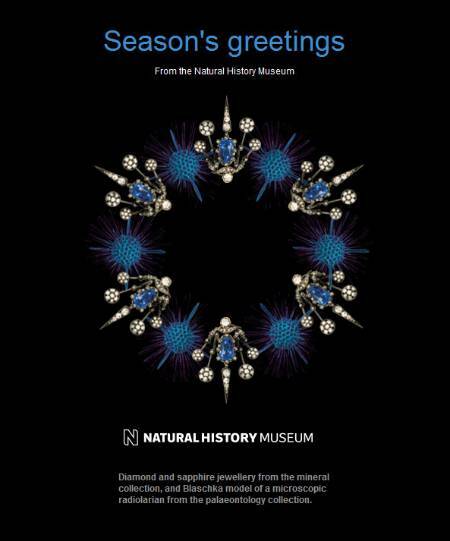 This year, the Museum has decided to follow a microfossil theme with its own e-Christmas card featuring the Blaschka radiolarian that is currently on display in the Treasures Gallery. To read more see my post about putting radiolarians on display. 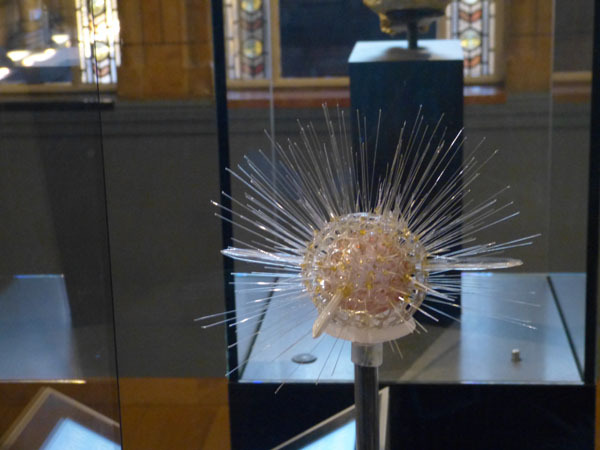 The Blaschka radiolarian model of Hexacontium asteracanthion currently featured in the Treasures Gallery, otherwise affectionately known as 'the red one', is magnified about 500 times. A CT-scan image of this has also appeared on the cover of the NHM Science Review 2011-2012. Finally I would like to thank all my readers for their support over the past year and wish you all a very merry Christmas and happy new year!